A broken Electorate system. 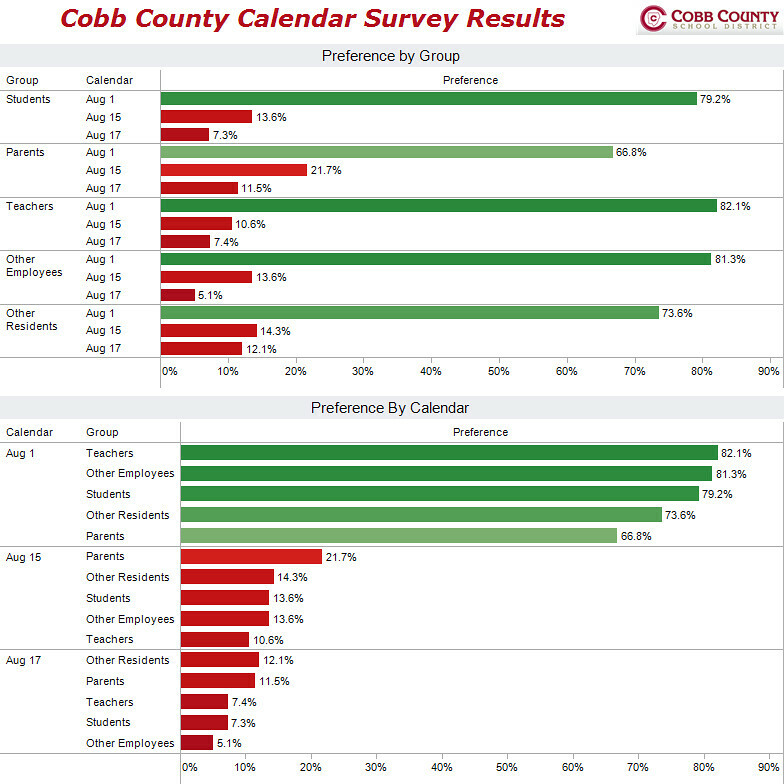 The Cobb County school calendar poll results visualized. View the School Board’s version of the results here. I wonder if they intentionally put the results on separate pages to make it difficult to compare them side by side. In the view above, you can clearly see that community overwhelmingly favors the August 1 calendar (the current calendar). Which way did the school board vote? 4-3 in favor of the August 15th calendar. Seriously! How the hell does this happen? Watch the motion hearing here. Needless to say, parents are outraged. In a Democracy, an Electorate system is often put in place so that the interests of many are represented by a few. The way it is “supposed” to work is that the representatives heavily weigh the opinions of their electorate when making decisions, but clearly four members of the school board have not in this case. It’s incredibly sad that special interests appear to have played a part in the vote, but then again, that’s nothing new here in the USA; votes can easily be bought (see campaign contributions and pork barrel spending). I’m proud of my wife for standing up and representing the interests of the great majority of Cobb County residents. Still...what is not shown here is this....How many of these parents and teachers voted for the Aug.1 start date simply because of the Dec.23rd winter holiday start date of the other two choices? What is also not shown is that many people deleted their cookies and voted 300 times each. Not an accurate reflection at all. The county data showed "all duplicate responses for a single calendar choice reduced to 2 responses"...and yes, I voted for Aug 1st because of Dec 23rd. Why does that matter? I voted and my vote was ignored by those elected to represent me. Yes, all duplicate responses WERE reduced to 2 responses. However, it could not detect how many people went to computer labs and voted numerous times. It would be very interesting to see just how many votes came from various schools compared to the number of employees who actually work at each school. Regardless as to whether or not people voted multiple times, I think it was still fairly obvious due to the numbers of people writing letters to the editor, showing up at board meetings,and emailing their representatives that the majority was clearly in favor of the balanced calendar. As far as local businesses losing money due to the Aug.1st start date, it is not scientifically possible to conclude that monetary loss was the result of anything other than an adjustment period as the community adapts. They didn't even allow a full year to pass before they made their economic claims, so their data is likely a lot more flawed than that from survey monkey. Think of all the money the local businesses will lose from lack of customers during that week leading up to Christmas. I know that as a working parent, I traditionally get a lot of shopping done once school is out and I don't have to worry about running the normal schedule with the kids and can also feel justified in taking time off. I guess this year I will be doing a lot more shopping online! To the person who said, "Still...what is not shown here is this....How many of these parents and teachers voted for the Aug.1 start date simply because of the Dec.23rd winter holiday start date of the other two choices?" Maybe the Unbalanced Foursome should have thought that through when the Chairwoman appointed two people from one side of the argument to come up with the other two calendar choices. They left no room for compromise. If she had appointed one person from each side of the argument, it would have shown that this was about coming to a compromise so that everyone could be happy with the outcome. Instead, she showed that this is about power. What she showed is that she is not opposed to abusing her power.